Phil Hanley began stand-up comedy by performing at open mics around Vancouver, often in between bands at music venues. Since settling in the United States, Phil has become a regular at NYC’s renowned Comedy Cellar. 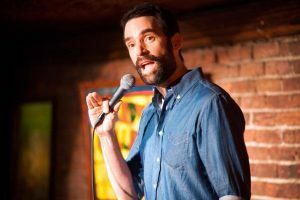 He has also appeared on The Pete Holmes Show, John Oliver’s New York Stand-up Show, and The Late Late Show With Craig Ferguson twice. In the past year, Phil has appeared on Late Night With Seth Meyers, @midnight and been on the road with Aziz Ansari. Phil’s Comedy Central stand up special “The Half Hour” also aired in 2016. Phil is the lead actor in the upcoming film Sundowners (2017) alongside Tim Heidecker. Phil has a role in the latest Amy Schumer movie.